There is a lot of money to be earned in the field of law. There is a good reason a lot of people are interested in becoming lawyers these days. Getting accepted to a top law school is not that easy though. You are going to need a decent LSAT score to have any chance of getting in. LSAT is not a difficult exam per se. But those who want to achieve a high score need to seriously prepare themselves for the exam ahead of time. 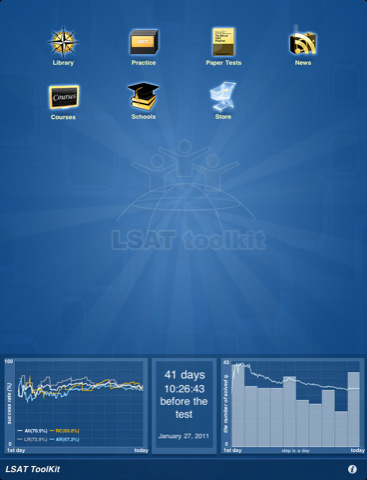 LSAT ToolKit is a helpful iPad application that lets law school candidates prepare for this exam on the go. In order to pass LSAT with flying colors, you need to know the material and take multiple mock tests prior to taking your official test. This app comes with 231 pre-load LSAT questions and thousands of other questions you can download (add-ons). LSAT toolkit gets you familiar with the types of questions you will face during your official exam. LSAT ToolKit not only have a ton of questions, it keeps track of your progress too. 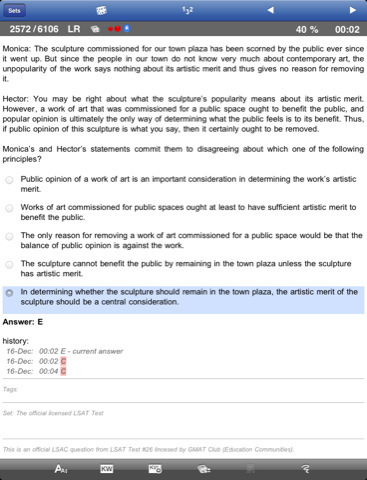 You can bookmark the questions you have answered wrong for future references. The question randomization feature is pretty nice too. LSAT ToolKit is not cheap by any means but is worth the investment if you want to fully prepare yourself for your LSAT exam. It provides you with relevant information, news, and training to get you as prepared as possible for your exam. The more you practice with it and use it to master the material, the better chance you have of acing your exam.